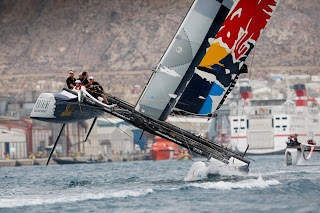 With the forthcoming 2011 Extreme Sailing Series™ venues, teams and innovations due to be revealed at a Press Conference in Portugal on 13 December, for the next four weekends British viewers can relive the action from the 2010 circuit that is changing the way sailing is seen. Four, half-hour shows, presented by double Olympic Gold Medalist Shirley Robertson and produced by Sunset+Vine|APP, kick off this Saturday 27 November at 7.25am on Channel 4. With on-board cameras on every Extreme 40 catamaran, the series takes the viewer into the heart of the racing where crews compete within a few meters of the crowds on tiny, ‘stadium-style’ race courses. Featuring Olympic Gold Medallists, multiple World Champions, round the World sailing stars and America’s Cup racers, the action is intense and even the very best are caught out. 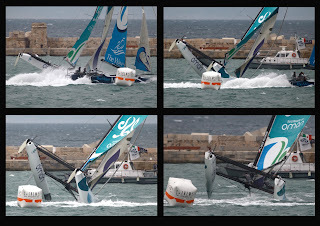 With closing speeds in excess of fifty knots and the potential for spectacular capsizes when it’s windy there is plenty of opportunity for drama. CLICK HERE to watch the trailer for the Channel 4 TV Series. The first man to lead a crew around the planet in less than fifty days was stopped in his tracks at the UK round in a crash that left him with no control. Heading towards a concrete wall at twenty knots he makes the call to abandon ship. At the Italian round in Trapani wild winds hit the fleet which saw the premier sailors lose control as their bows head deep underwater, the crew suspended in mid air with no steerage. And at the finale in Spain the youngest skipper on the tour has less than a second to decide whether to sail safe or take a risk that could see his season end in shattered carbon fibre. Five events, 130 races, 14 teams, but who will be crowned overall 2010 Extreme Sailing Series™ Champions? Watch this weekend, and for the next three weeks, on Channel 4 to find out more.